Fuzzy samples contain measurements that are only partially associated with their underlying population. This paper offers numerical indices for the difference of population distributions approximated over fuzzy samples. 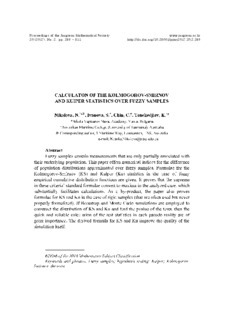 Formulae for the Kolmogorov-Smimov (KS) and Kuiper (Ku) statistics in the case of fuzzy empirical cumulative distribution functions are given. It proves that the supreme in these criteria' standard formulae convert to maxima in the analyzed case, which substantially facilitates calculations. As a by-product, the paper also proves formulae for KS and Ku in the case of rigid samples (that are often used but never properly formalized). If Bootstrap and Monte Carlo simulations are employed to construct the distribution of KS and Ku and find the p-value of the tests, then the quick and reliable calculation of the test statistics in each pseudo reality are of great importance. The derived formula for KS and Ku improve the quality of the simulation itself.